CarGurus has 21,572 nationwide Enclave listings starting at $3,950. The Buick Enclave crossover vehicle seats up to 8 passengers in its roomy, comfortable cabin and comes well-equipped with a solid list of standard features, including new hill-hold assist braking technology for 2012. The 2012 Enclave's V6 engine struggles at times to move the vehicle's considerable weight, especially when it's fully loaded, and some testers find the Enclave's ride and handling unexciting. The Buick Enclave remains a crowd pleaser for 2012, for a number of reasons, including its car-like ride, upscale cabin, expansive cargo space and ability to carry up to 8 passengers. Although it's a large vehicle, the Enclave moves and handles well, although some owners would like to see better performance as well as better fuel economy numbers. With an updated Enclave scheduled for 2013, the 2012 version might be priced right for large families seeking a capable, well-equipped ride. In anticipation of a design refresh for 2013, Buick gives its capable Enclave crossover vehicle only a few minor updates for 2012. The most notable change involves the trim lineup. Gone are the CX and CXL trim levels from the previous year. In their place, Buick reconfigures the lineup into 4 levels with the self-descriptive names of Base, Convenience, Leather and Premium. In addition, Buick adds hill-hold assist braking technology, which holds the brakes for 1.5 seconds when the driver's foot lifts off the brake pedal while starting on an incline, to the Enclave's standard equipment list, and offers new Crystal Red Tintcoat and Stone Gray Metallic exterior colors. The automaker also adds an accessory power outlet to the center console for 2012. Introduced in 2008, the Enclave comes standard with front-wheel drive (FWD), although the automaker offers full-time all-wheel drive (AWD) as an option. However, the AWD system is designed for wintry highways and inclement road conditions, not for serious off-roading. The automaker backs the Enclave with a 4-year, 50,000-mile bumper-to-bumper warranty and a 5-year, 100,000-mile powertrain coverage. Buick also equips the Enclave with QuietTuning, which helps reduce road and wind noise in the cabin. Up front, exterior features for the 4-door Enclave include the automaker's signature waterfall grille, automatic on/off HID wraparound headlights, foglights and a sculpted hood accentuated by chrome portholes. Aerodynamic sedan-like lines along the sides and a power liftgate, dual chrome exhaust tips and multi-lens taillights in the rear also come standard. Heated power side mirrors with integrated turn signals complete the exterior look. Inside, with an optional second-row bench seat, the Enclave can seat up to 8 passengers. Cargo space ranges from a generous 24.1 cubic feet with all three rows of seats in place to 115.9 cubic feet with the second and third rows folded down. Thanks to its winning combination of design, comfort and versatility, the Enclave ranks near the top of its automotive market segment according to a number of reviewers. Competitive vehicles include the Jeep Grand Cherokee, the Hyundai Santa Fe, the Mazda CX-9, the Ford Edge and the Honda Pilot. The Enclave's 3.6-liter, direct-injection V6 engine rolls over from the previous year unchanged. Featuring variable valve timing, it produces 288 hp and 270 lb-ft of torque, and drives the Enclave from 0-60 in about 8.2 seconds. The V6, which runs on regular fuel, links to a Hydra-Matic electronically controlled 6-speed automatic transmission and posts fuel economy numbers of 17/24 mpg. 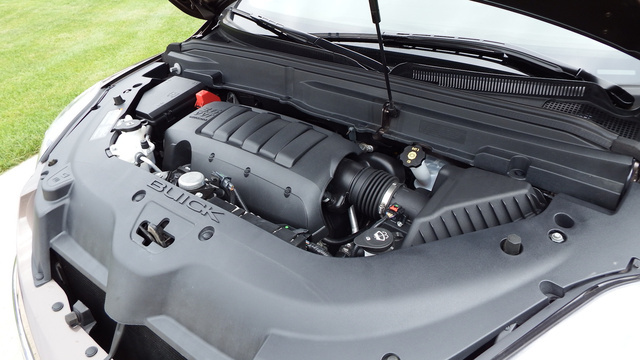 Owners can add Buick's Intelligent AWD system as an option. The system monitors traction for all 4 wheels and activates automatically when it detects wheel slippage, directing power to the wheels with the most traction. When equipped with AWD, fuel economy drops to 16/22. With an optional Trailering Provision Package, the Enclave can tow up to 4,500 pounds. While the V6 engine delivers decent horsepower and torque numbers and adequately moves the Enclave along, some testers note that the powertrain leans more toward comfort and smooth operation than sportiness. Quick acceleration and sport-oriented maneuvers are not the point here. Rather, the engine and transmission deliver a balanced performance, with carefully calibrated shifting and acceleration designed to ensure passenger comfort. Buyers who seek a sportier or more powerful alternative might want to look at such vehicles as the Mazda CX-9, which offers a sportier driving experience, or the Dodge Durango, which offers an optional V8 engine. Like its performance, the Enclave's ride and handling emphasize comfort and competence over sportiness. Although it's not as nimble or agile as come of its competitors, the Enclave certainly delivers a stable ride, thanks in part to its low ride height and wide stance. Some testers compare the Enclave's ride to that of a luxury sedan, with a cushioning suspension, responsive steering and confident braking. The Enclave handles well in tight curves, with minimal body roll, and thanks to acoustic laminated glass, triple door seals and sound-deadening materials in the floor and engine compartment, all part of Buick's QuietTuning process, exterior noise and vibration levels are kept to a minimum in the cabin. The 2012 Buick Enclave rides on a 4-wheel independent suspension with MacPherson struts and a direct-acting stabilizer bar in the front and a multilink configuration in the rear. Variable-effort power-assisted rack-and-pinion steering also comes standard. The optional AWD system, available on all trims, automatically distributes torque based on vehicle speed and wheel slippage to ensure optimal traction in all types of driving situations. The front and second-row seats provide plenty of comfort and support over long distances, but ride comfort drops for the third-row bench seat. However, passengers in the second and third rows will find plenty of legroom, thanks to the SmartSlide feature, which makes it easy to move the second-row seat backward or forward at the pull of one handle to adjust legroom in both rows, and to configure the cabin to carry just about any type of cargo. Numerous cubbies throughout the cabin, as well as a cargo storage area under the rear floor, provide plenty of additional storage space. All Enclave trims ride on 19-inch machined aluminum wheels except for the Premium, which gets 19-inch chrome-clad wheels. Owners can add 20-inch chrome-clad wheels on the Premium trim. All Enclaves come equipped with all-season tires. Its luxury-oriented, well-equipped cabin remains one of the Enclave's highlights and top selling points. Testers describe the interior as stylish and classy, with high-quality materials and a family-friendly design, thanks in part to three rows of seating. In its standard configuration, the Enclave comes equipped with second-row flip-and-fold captain's chairs and a third-row 60/40-split bench seat that seats 3, for 7-passenger seating, but owners can switch out the second row for a fold-flat bench seat, which increases seating capacity to 8. The Base and Convenience trims receive an 8-way power-adjustable driver's seat and a 2-way power-adjustable passenger seat. The Leather and Premium trims add memory settings for the driver. The cloth upholstery in the lower-end trims has a premium feel, while the Leather and Premium trims receive perforated leather upholstery. In addition, the Leather trim gets heated front seats, while the Premium trim adds heated and cooled front seats. The attractive dashboard, with its swooping curves and arches, features a conveniently located quartz analog clock above the center stack. Textured surfaces on the dash and a leather-wrapped tilt/telescopic steering wheel with mahogany accents lend an upscale feel, while such standard features as tri-zone climate control, an auto-dimming rear-view mirror, Bluetooth and an AM/FM audio system with SiriusXM satellite radio give the Enclave a leg up on its competition. Steering-wheel-mounted audio and cruise controls, remote keyless entry, a universal home remote and power windows and door locks are among the Enclave's other standard features. In addition, the Enclave's standard OnStar system includes 6 months of the Directions and Connections plan, which includes turn-by-turn directions. The Convenience trim level adds a rear-view camera, ultrasonic rear parking assist and a remote vehicle start system, while the Leather trim adds a 4-way power-adjustable passenger seat, in addition to leather upholstery and heated front seats. The top-of-the-line Premium trim gets a 10-speaker Bose audio system and a power tilt/telescopic steering wheel, as well as heated and cooled front seats. Options include a sunroof, available on all trims, as well as navigation and a rear-seat entertainment system, available on all trims except the Base. In addition, Buick offers the Bose audio system as an option on the Base, Convenience and Leather trims. The 2012 Buick Enclave was named a Top Safety Pick by the IIHS, thanks to its top rating of Good for protecting passengers in frontal, side-impact, rear and rollover crashes. Similarly, the NHTSA gave the Enclave a top safety rating of 5 out of 5 stars, which breaks down to 5 stars for protecting passengers during side crashes and 4 stars for frontal and rollover crashes. Six airbags, including side-curtain airbags, come standard on the Enclave. Daytime running lights, 4-wheel antilock brakes, traction control and GM's StabiliTrak electronic stability control system also come standard. A Panic Brake Assist system provides additional brake pressure during emergency braking situations. In addition, the standard OnStar system includes such safety features as automatic crash response, roadside assistance, vehicle diagnostics, emergency services and remote door unlock. Owners remain enthusiastic about their Enclaves, citing the crossover vehicle's smooth ride, comfortable cabin, stylish exterior and overall practicality and reliability as winning points. They also say it's the ideal family car, thanks to seating for up to 8 passengers and extensive cargo space and versatility. Owners especially like the Enclave's quietness and ease of handling, as well as its overall build quality. However, some owners complain about the Enclave's fuel economy numbers, especially at a time when most competitive SUVs and crossover vehicles are pushing up their mileage numbers due to engine, transmission and aerodynamic enhancements. Some owners also note blind spots out the rear, which affect visibility and safety. In addition, some owners say the Enclave can get a little noisy at higher speeds. 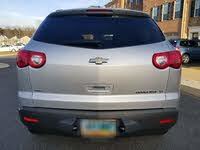 Overall, however, Enclave owners give good marks to their vehicles. 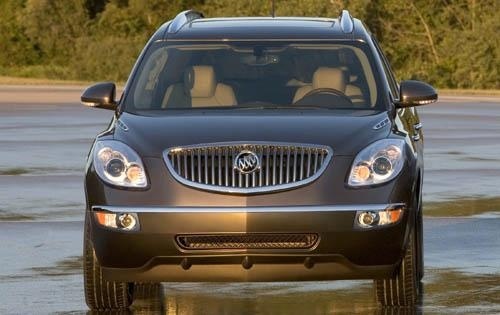 What's your take on the 2012 Buick Enclave? Have you driven a 2012 Buick Enclave? My 2012 Buick enclave keeps ejecting the DVD. It will not play at all. If you wish to carry a large amount of clothing on hangers, lots of luck! The hangers are located behind the second row of seats. Can anything be done?